Reinbek bei Hamburg: Rowohlt Taschenbuch Verlag, 2001. 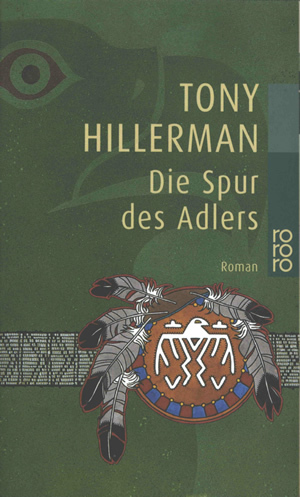 This is the paperback reissue of the German version of The First Eagle by Tony Hillerman, published by Rowohlt Taschenbuch Verlag in Reinbek bei Hamburg, Germany, in 2001. The German translation is by Fried Eickhoff. The cover design is by Cathrin Günther and the illustration is by Jürgen Mick. The overall cover color is medium green and features an opacified background illustration of an eagle's head in profile. In the foreground is an illustrated beaded band with a circular emblem overlaid featuring a stylized eagle figure. The series logo "rororo" is printed in tan along the edge of the front and back covers. The back cover is green and features a synopsis, printed in white, along with praise from the New York Times. The bar code is at the bottom of the back cover.